Mage, now there's a band name I can get behind, good thing the sound is just as good! Crushing stoner doom with a taste for all that is occult, their new record Last Orders is the kind of monolithic crushing music that guys like me fall in love with in seconds. Doom for doom freaks, Mage are steeped in Sabbath worship and I get the distinct impression they will never break the faith. These guys have a wonderful sense of forward motion and their colossal riffs are going to leave you begging for more. 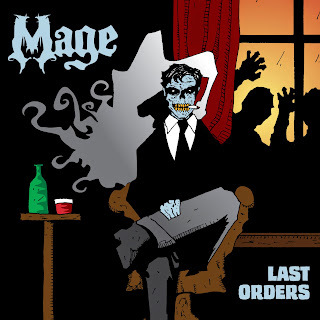 Last Orders proves that Mage gets it and will not soon be silenced. I think that a large part of what makes the Mage sound so special to me is the way that the band bring in old school psychedelic elements to reinforce the crushing power of many of the riffs that they only hint at in other tracks. These songs are loud and proud, odes to the almighty influence of Black Sabbath, Budgie, and maybe even Electric Wizard. I think though, what sets Mage apart from many of their modern peers is their ineffable sense of groove. Songs like Violent Skies prove that these guys know how to rock and deliver riffs that hit you like a ton of bricks. When the band brings out the heavy stuff you know it and it feels like it may never stop. In short, Last Orders is simply more proof that doom metal is reaching a new zenith in 2014. These songs are fun to listen too and show a band who seem prone to take the world by storm. With roaring vocals and a wonderful sense of crushing destruction. Mage are bringing the doom at a very high level and I get the impression they're going to explode soon. This is the kind of band who could rapidly gain a lot of cult popularity and they should keep going. With a distinct sound and a clear passion for the music this is the kind of thing that makes doom beautiful. Thanks for the review Matt! Much appreciated. Glad you liked it.